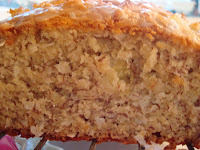 So for all of you out there that L-O-V-E banana bread, here's a great recipe that has a tropical twist for those days where you wanna just getaway! I found this recipe in a Cooking Light magazine and was hooked from the minute I saw it! I don't know what captured me more, the picture, the flavor combinations, or the fact that this bread was named the "best bread recipe" for Cooking Light. Well, no matter what it was I'm glad that I tried this one out! 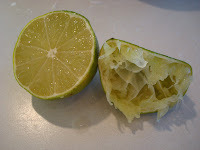 The coconut flavor was very subtle, but blended wonderfully with the lime flavor. And I wouldn't have guessed that banana and lime would go well together but I'm a believer!! The recipe also calls for plain yogurt, but poor fridgy only had flavor yogurt, fortunately one of them was Key Lime Pie and it worked out soo great, I actually think that was a better choice than plain yogurt. 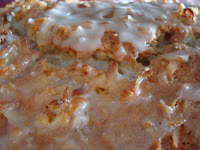 This was truly one of the best banana breads I've ever had...and you can ask my co-workers for their stamp of approval, because this bread didn't even make it through the first hour at work! Hope you all like it as much as I did! 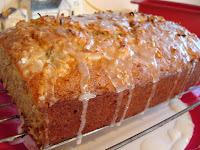 I give you Coconut Banana Bread w/ Lime Glaze, courtesy of Cooking Light! Place granulated sugar and butter in a large bowl; beat with a mixer at medium speed until well blended (about 1 minute). Add the eggs, 1 at a time, beating well after each addition. 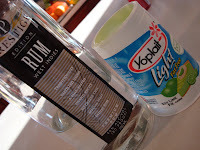 Add banana, yogurt, rum, and vanilla; beat until blended. Add flour mixture; beat at low speed just until moist. Stir in 1/2 cup coconut. Spoon batter into a 9 x 5-inch loaf pan coated with cooking spray; sprinkle with 1 tablespoon coconut. Bake at 350° for 1 hour or until a wooden pick inserted in center comes out clean. Cool 10 minutes in pan on a wire rack; remove from pan. Combine powdered sugar and juice, stirring with a whisk; drizzle over warm bread. Cool bread completely on wire rack. Thanks for bringing back this recipe as I stare at a bunch of aging bananas. I tried it years ago and loved it!